One move to switch – just one quick hand motion is all the Hoji Pro Tour needs to go from a comfortable touring boot to a stiff alpine ski boot. Up to 60 degrees of cuff rotation lend the necessary room to move on the climb. The Hoji Lock System is the heart of the Hoji Pro Tour. The system is as simple as it is brilliant – the lever sets the inner workings in motion. In doing so, two pins are pushed together like a tongue and groove, creating one unified piece of upper and shell without any play . The Hoji Lock System means the strengths of the Hoji Pro Tour play out both on the climb and on the descent. Simple entry in the binding no matter where you are. Master Step is the TÜV-certified step-in system that offers twice as much comfort stepping into touring tech bindings as before. The Master Step creates one sturdy unit between boot and binding for maximum loads both climbing and descending. Speed Nose – the connection between boot and binding taken to a new level. Save even more energy on the climb with the minimal toe and a setback pivot point. 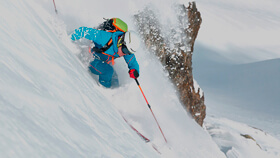 Uphill performance – created by the cuff rotation of the ski touring boot. With up to 55 degrees of rotation, the Hoji Pro Tour offers maximum freedom of movement. Whether in the backcountry, on steep approaches, or during a kick turn in deep powder, your freedom of movement knows no limits thanks to huge flexibility.